Yes, I would love to order a miniature portrait in acrylics. *Max. 5MB each. Format jpg/jpeg/gif/png. Tip: if you have more photo's, you can send them later by email. NOTE: By sending this form you agree with ordering a miniature portrait in acrylics of €130 ♥ Currency Converter. Size appr. 7/8 cm big on appr. 11×11 cm paper, without background. Extra wishes? You can add those in your email. Additional costs may apply. Delivery will be by secure postmail or (free) collection at the studio. These are additional costs depend on your country, this varies between 10-25 euro. You only buy the portrait if you are 100% satisfied! Extra photo’s can be sent later including your extra wishes. You will recieve an order confirmation in PDF. You return this form with your signature. Your commission is ready to go! The delivery time depends on Marjolein scedule. In case it’s a gift, you can let Marjolein know. Marjolein contacts you when it’s finished. When you’re happy, it will be sent to you by secure postmail. 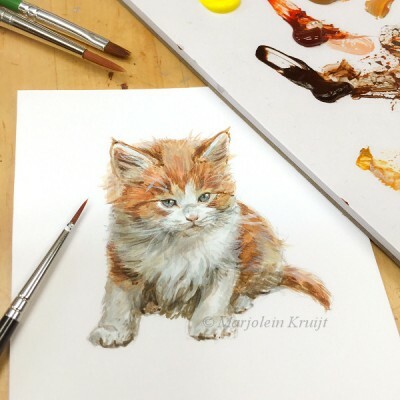 Feel free to visit the Studio in case you wish to discuss all options for your (pet portrait) Or if you like to see available artwork in real life befor purchasing. Original handpainted miniature portraits of other animals can be seen/bought here. Of course, your pets are most welcome in the studio too!